Stone Teepees beer label with story. 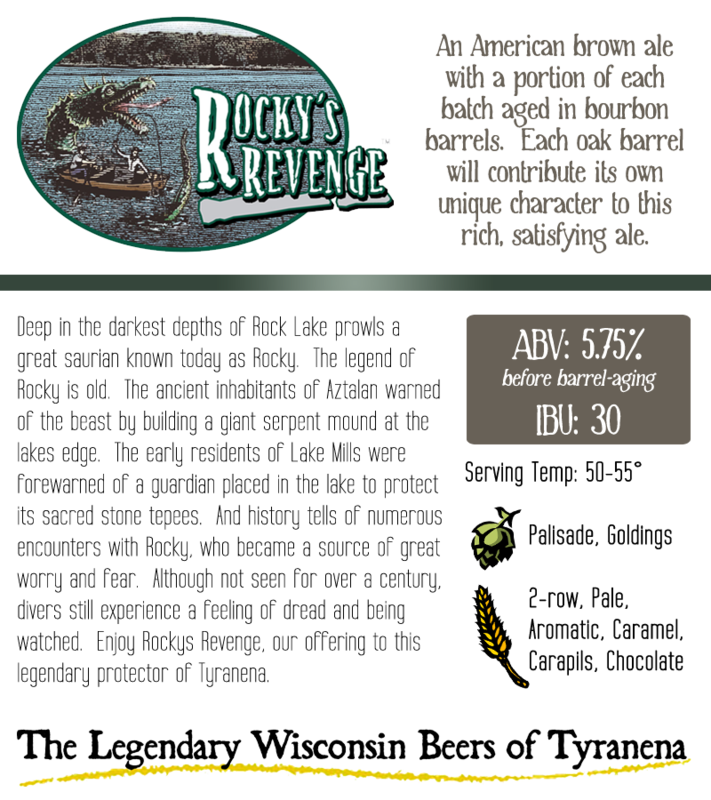 Rocky's Revenge beer label with story. I've been watching America Unearthed (H2 channel) since the early episodes, including the very first one where they claimed to have found Mayan pyramids and artifacts in Georgia. (I didn't think to review it at the time.) You can watch it on Youtube. or on H2. If I remember correctly, the most interesting thing was the revelation that the Maya Blue (pigment) used in Georgia came from the same source geologically as the Maya Blue used by the Central American Maya. The premise of the show is that Scott Wolter, a forensic geologist, investigates various claims that he always says "will change history" such as proving Vikings and other pre-Columbian Europeans were in the New World prior to the 15th century. He is never able to conclusively prove anything (and in a recent case, having to do with a giant rock wall in Texas, he actually disproved the theory that the long wall was man-made). Last night's Underwater Pyramid episode begins with two duck hunters in a rowboat being caught on top of an underwater step pyramid in a lake (Lake Mills, Wisconsin) in 1900. Very dramatic. 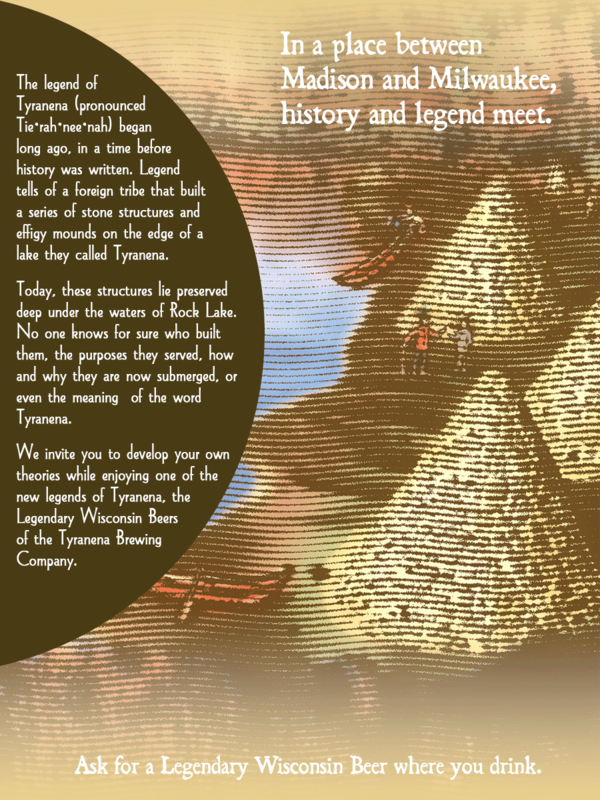 Wolter meets his contact at Tyranena Brewing Company*, named for the same lake (now known as "Rock Lake"). Their beer label shows three stone pyramids and says "Stone Teepee." The Native Americans in the area tell of a "foreign tribe" that built "stone structures and effigy mounds" in the area of the lake, now underwater. Supposedly, the contact says, the Aztecs built them. Some scuba divers went down and found pyramids. But the drawing looks nothing like a pyramid to me--a pyramid has a square bottom and 4 triangular sizes. This has a rectangular bottom, two triangular sizes and two rectangular sides. It looks like a stone version of a long house, not like anything I've ever seen from Meso-America. Another legend, also on a beer bottle, is "Rocky's Revenge", about the "protector of the pyramids" and the label shows a kind of prehistoric dinosaur. It's "Wisconsin's version of Nessie." Local scuba divers feel like the monster's watching them and get creeped out by it. Wolter declares his intention to dive the pyramids with a personal submarine (submersible), although he also declares the idea of the Aztecs traveling that far "bizarre." The FuGo subs are silly-looking bright yellow tiny things, like the Mini Coopers of the sub world. Then the show turns into an ad for the sub. Product placement, anyone? First the beer, now the sub. Sigh. Looking up Lake Mills, I see that the lake is half the town, and at the other half is something labeled "Aztalan" which is very close to the word for the Aztec's legendary homeland, Aztlán. The Rocky's Revenge label mentions Aztalan as well. Wolter's next stop is a visit with Dr. Roberto Rodriguez, who has "studied the Aztecs," whatever that means, and who is an "Aztec Migration Expert." He says he "followed the corn," because corn was originally domesticated in the southern Mexican area (albeit thousands of years before the Aztecs appeared on the scene). This gives Wolter a chance to luridly describe people being sacrificed to the "corn god" and "corn goddess" (great use of deity names there, Wolter) and gasp, some of the sacrifices were even eaten. Dr. Rodriguez says he discovered the Aztec legend that they came originally from the North (ie, North America, or at least the southern part of it) which completely flabbergasts Wolter, as if no one ever in the history of talking about the Aztecs knew their legend of their northern homeland. Which I already mentioned, above, before even getting to this section of the show. Wolter goes on to talk about "Roberto's remarkable theory" that the Aztecs came from American and moved to Mexico. Remarkable theory? It's an ancient legend. This guy didn't discover it. This is disingenuous and this sort of stuff angers me. Maybe Wolter knew the Aztecs believed they came from the North, maybe he didn't, but to pretend this guy invented the idea is ridiculous. I don't believe anyone has ever found what was the ancient homeland of Aztlan, which could have been in the American Southwest, or higher up, or even in very northern Mexico. We'll probably never know for sure. Dr Rodriguez explains that the Aztec pochtecas (traveling merchants) did travel all over the continent (perhaps how the Maya Blue got to Georgia?). 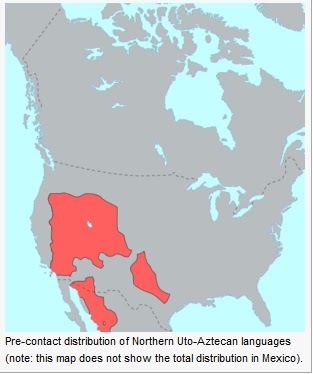 I know that those trade goods can be traced by modern anthropologists who find them in excavations, and also borrowed words in other languages can show those trade routes, such as the study of the Uto-Aztecan languages, the red region shown on the map from Wikipedia, to the right. You might notice that the red on that map goes NO WHERE near where these alleged Aztec pyramids are, up by Lake Michigan. The good doctor offers some ancient maps to Wolter, to prove his "theory" about North America being the Aztec homeland. One of them is to the right. 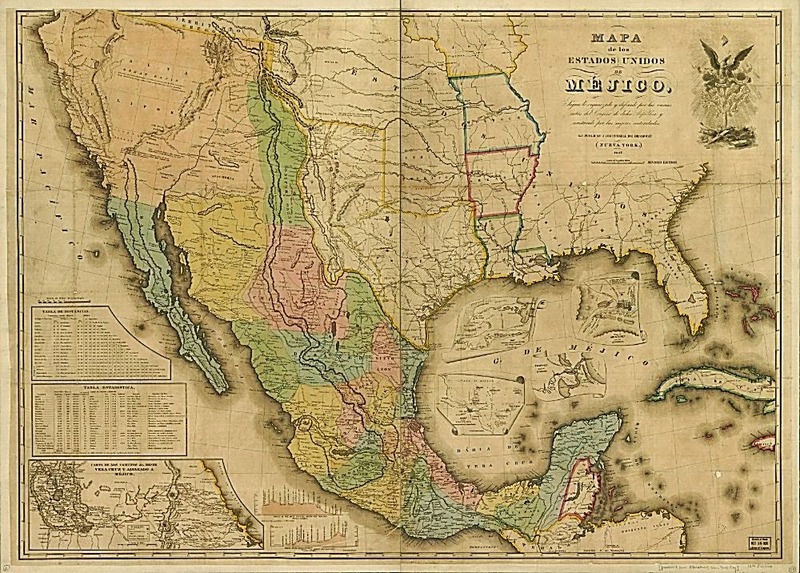 It is from the Treaty of Guadalupe Hidalgo (Wolter constantly calls it, incorrectly, the Treat of Hidalgo) in 1848. Dr Rodriguez says that in the Four Corners region, this map has a label that it's the homeland of the Aztecs ("Antigua residencia de los Aztecas"). I was only able to find a translated version in close-up, which also shows the "ruins of the 2nd houses of the Aztecs" not far away. Dr Rodriguez thinks the Great Salt Lake is the actual origin of the Aztecs, based on some even older maps. But on newer maps, supposedly this information is redacted. Dr Rodriguez seems to believe it's a racist conspiracy, because everyone tells Mexicans to "go back" to Mexico, but they really came from North America so they are already "back" and that won't do. Even though this map shows the ancient Aztec homeland as no where near Wisconsin, Wolter can't let it go. Maybe the lake wasn't the Great Salt Lake. Maybe it was Lake Michigan. Or this Rock Lake. He doesn't know when to quit. I'm going to turn aside again and interject my own thoughts: If the Aztecs' homeland was Rock Lake, or even Lake Michigan, they would not have been labeled "foreigners" by the natives living in the area. They would have BEEN the natives living in that area. Once the Aztecs went south, they stayed south, except, as mentioned already, for the pochtecas, who certainly didn't stick around long enough to build pyramids in any places they visited. And then Dr Rodriguez mentions a few words that are cognates in Aztec (Nahuatl) and the local native language: Michigan and Michoacan both mean "place of fishes" (pronounced almost exactly the same), as well as "mocatzin" and "moccasin" (both meaning shoe). I think these can be explained by the pochtecas bringing language from place to place along with trade goods. "What's this foot thing?" "It's a mocatzin" (other person doesn't hear the slight "t" sound) "Oh, a moccasin." Finally, halfway through the show, Wolter is ready to dive in his little yellow submarine so he can prove that the rock structures were built by Aztecs and somehow the sea monster also has Aztec relevance although I can't comprehend it, and evidently it was more important to include another product placement/ad for the subs rather than explain how the Aztecs placed the serpent in the lake. The lake that wasn't there when the structures were built. But that was perhaps the lake that was the homeland of the Aztecs. I'm utterly confused and there are still 30 minutes to go. Finally, they are diving, talking about how Rocky is a cryptid and they're looking for him as well as for the pyramids. More time is wasted because Wolter gets himself stuck into the bottom's mud, it's murky, there are weeds, all kinds of false drama because his battery is running dead and he's not found anything. Except that it's "creepy" down there. And after that ONE FAILED DIVE he gives up. Doesn't dive again. Doesn't try any kind of sonar. Just wanders off, heads to that place I mentioned earlier, Aztalan state park. He meets the former Wisconsin state archeologist, who says they've never found a pyramid in the lake either. Of course if Wolter had checked with them first, it would have been a non-story. The archeologist brings him to a partially restored archeological site, dated to around 1,000 A.D. It's a heavily fortified site, with defensive log walls. 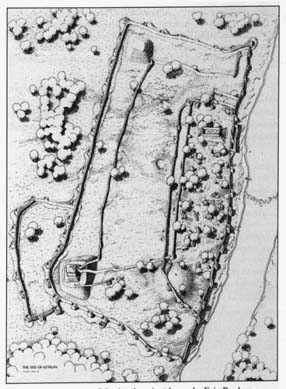 Supposedly new people moved in with existing people, and thus the fortification was to protect the newcomers from the other older tribes. Apparently this information came from their middens. Wolter keeps talking about how the Aztecs built walls to keep the rich people in (they did? ), and since the archeologist says this town had a wealthy quadrant, with its own walls (the long thin area to the right of this map next to the trees, if I'm following the on-screen map correctly), and that one mound, that it's exactly like an Aztec city. One of the pyramids was actually a burial pyramid, again, something Aztecs didn't do. On top of another pyramid was the sacred fire, only put out once a year when the corn was about to be planted, because these people, like the Aztecs, were "obsessed by corn." Now personally I'd call the Aztecs many things, but corn-obsessed isn't even on my radar. The archeologist describes a "princess mound" where a young woman was buried with high-status items. Immediately Wolter says she must have been sacrificed when the corn crop was bad. Because, of course, there is no chance she was the beloved daughter of the ruler who died young and was buried with riches by her grieving family. The archeologist says the settler who discovered the ruins made up the name after finding out about the Aztec homeland. That the site is dated absolutely to 1,000 AD, abandoned by 1200 A.D. and has nothing to do with the Aztecs, and was built by the Mississipians. And he brings up Cahokia, as being the capital of the Mississipian civilization. 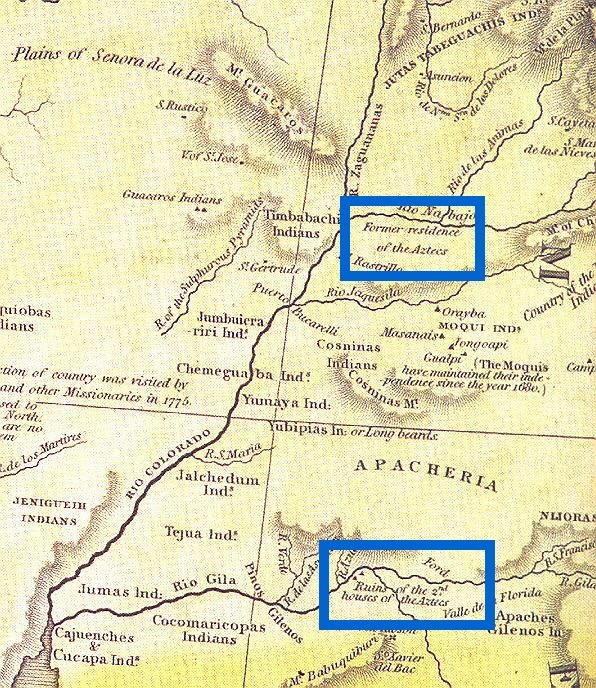 Wolter leaps to another conclusion, that the Mississipian people left this site, wandered to the Great Salt Lake, and from there to central Mexico, totally discounting what's already been discussed about the origins of the Ute-Aztecan language family. 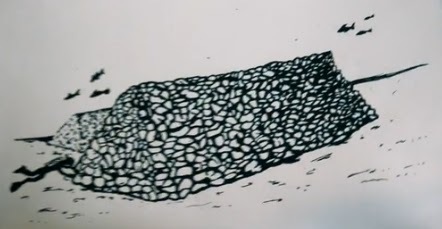 He admits that if there are any rocks in Rock Lake, they are probably glacial erratics, but hey, he did PROVE his friend's THEORY that the Aztecs really came from the North. Who knew that? *Addendum: My artist Mike Giza read this review and thought it was too snarky. Then he watched the episode, and thought it wasn't snarky enough! He did point out one thing I missed...that apparently some of the research for the episode involved reading beer labels. I did mention the labels but I wasn't thinking about the absurdity of beer labels as sources for historical fact.